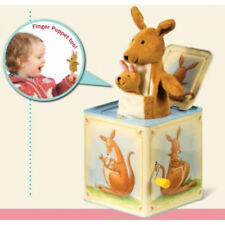 Schylling Kangaroo Jack in the Box Tin Toy - NEW and MINT - SALE! Very Nice Vintage Jack in the Box with Sock Monkey theming. in very good condition as shown in the photos. ☆2011 FAO Schwarz Jack-In-The-Box TEDDY BEAR. (5 1/2 × 5 1/2 "). We will not cancel orders. Orders unpaid will go to an unpaid item case. 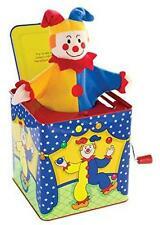 6 months & up, The classic Jack in the Box toy featuring the song "Mickey Mouse March" is sure to entertain any child. Wind the handle on the tin box to reveal the popping Mickey Mouse! Very cute princess in good gently used condition. This Jack in the Box is in very good working order. Crank is easy to turn, music is nice and clear and the box itself has only minimal wear (i.e. a few scratches and a small dent or two!). Colors are bright. 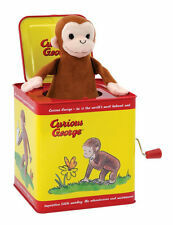 New ListingCurious George Jack in the Box. SHYLLING. Curious George Jack in the Box . SHYLLING. 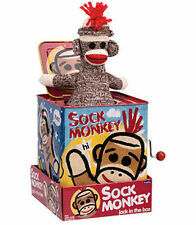 ☆SCHYLLING SOCK MONKEY JACK IN THE BOX. (5 1/2 × 5 1/2 "). We will not cancel orders. Orders unpaid will go to an unpaid item case. Teddy Bear Toys R Us Exclusive FAO Schwartz Musical Jack In The Box 2011. Condition is Used. Shipped with USPS Priority Mail. There are some slight dents, which are shown in the photos. The music portion works perfectly and the teddy bear pops out as the jack in the box great as well. This is a rare one! Not only is it "Mother Goose," but it is "A Carnival Product.". There is a noticeable scratch and dent on the "Mary, Mary" side as well as a small dent along the top rim on the "Jack and Jill" side. VTG~JACK IN THE BOX Toy~©1997 Schylling~All Around the Mulberry Bush....WORKS!. Condition is Used. Shipped with USPS Priority Mail. 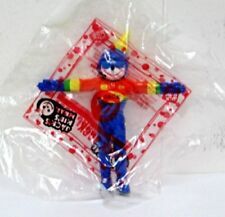 Marolin Papiermache Germany, Jack in the box Clown. I have a total of 12. Ten of these boxes are in the bags and sealed. These will be the first to go out. The other two have been opened. The Dark Knight Joker Jack-in-the-Box - Comic Con Convention Exclusive Limited edition and individually numbered. What is lurking inside this musical tin box?. Retro-styled jack-in-the-box featuring THE JOKER™ fromThe Dark Knight™! 1970 MATTEL CAT IN THE HAT!! MUSIC BOX!! JACK IN THE BOX!! WORKING!! 1970 MATTEL CAT IN THE HAT!! MUSIC BOX!! JACK IN THE BOX!! WORKING!!. Condition is Used. Shipped with USPS Priority Mail. Cat in the hat Dr. Seuss jack in the box ! Working condition! Cat in the hat comes up and faces towards the left . Also on bottom of box , someone signed it with RYAN name . In very nice condition and clean. Please see photos for details . Will send more photos upon request if needed . Curious George Jack in the Box. SHYLLING.